That blue embroidered Topshop dress – it resembles one of my favorite dresses from the Fall 2013 runways, the china blue Valentino stunner (that costs more than $12,000). I think the Topshop version will make my wallet much happier, don’t you? My favorite nail polish in springy shades for Easter! These are part of the Essie Resort ’13 collection – get them all here! I’m always on the lookout for easy neutral bags for everyday wear. The new-to-me designer, Rachael Ruddick, designs classic shapes in the best basic shades. I’m particularly fond of the East West Shopper and Le Trop crossbody. 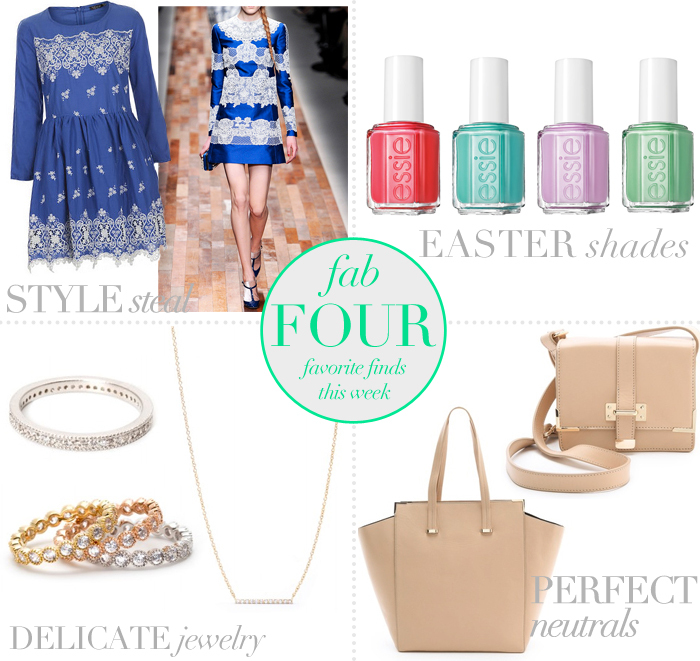 That blue dress is totally you and I’m now also obsessed with those neutral bags…amazing picks! I just bought a new pretty polish for Easter, but still all of those above are really tempting! Especially the first two. Also in love with that shopper bag…I’ve been thinking about getting a new summer bag, maybe that one will have to make it on my wishlist!